This year's AES show in San Francisco sees the launch of Focusrite's new multi-channel firewire audio interface, the Saffire PRO 40. - Unique Loop-Back facility for routing audio between software applications via Saffire PRO 40 Control. - Suite of Focusrite VST/AU plug-ins (Compression, Reverb, Gating and EQ VST/AU plug-ins). - Two separate headphone buses with independent level control available on the front panel. 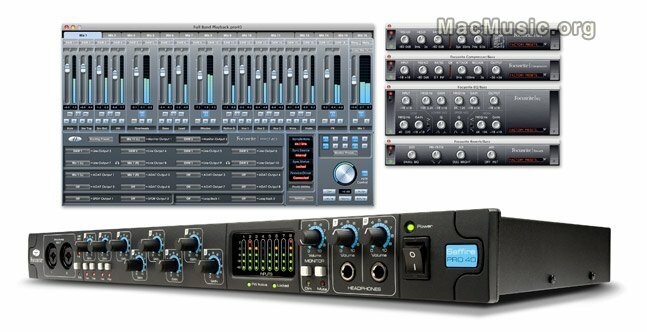 - Saffire Pro 40 Control Zero-latency DSP Mixer/Router (18 x 16 DSP mixer). - Unmatched routing flexibility. The user is able to route any input signal or DAW output, or a mix of both, to any of the 20 outputs. Saffire Pro 40 will be shipping worldwide, October 2008. For pricing details, please contact your local Focusrite distributor.